According to this article it looks like Kansas City, KS is Google's 1-Gig Fiber Winner. Congrats to the little city across the river. Wonder if I will be able to pick up free internet? 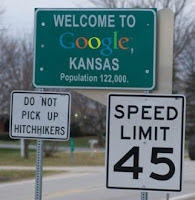 March 13, 2010: Topeka, the capital city of our state, officially changed it's name to Google in hopes of snagging some of that experimental high-speed fiber networking that Google is offering. The mayor of Duluth, MN jumped into a freezing Lake Superior last month.. Sarasota, FL changed it's name to Google Island..and I suspect others will find wild and crazy ways to lure Google to their cities.. it is big! What is your city doing to chase after Google broadband?